We hosted a panel event as part of Plastic-Free July that asked: why do we send so much of our plastic waste to China for recycling? What actually happens to it once it’s there? Why don’t we handle our own plastic waste? 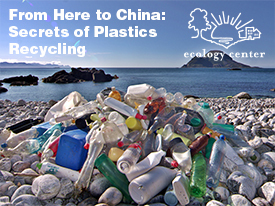 With its “Green Fence” policy, China has become choosier about the plastic waste it accepts, while US residents are creating more plastic waste than ever. Panelists included: Steve Lautze from the California Association of Recycling Market Development Zones, Patty Moore, President of Moore Recycling Associates, and Peter Schultze-Allen, a recent Zero Waste Commissioner for the City of Berkeley. The panel was moderated by Ecology Center Executive Director, Martin Bourque. Click here to open PDF of presentations in a new window. Presentations have been combined into a single PDF, in the order they were presented at the event. Patty Moore is President and CEO of Moore Recycling Associates, Inc.
Involved in the field of recycling since 1983, Moore was the principal author of “How to Implement a Plastics Recycling Program” and a participant in a Department of Commerce, Plastics Trade and Investment Mission to China in 1996. She continues to have a strong interest and understanding of the critical role played by China and other developing nations in domestic recycling efforts. Moore provides consulting services to industry-based clients, such as the American Chemistry Council, and she is held in high regard by many Zero Waste and recycling advocates as a reliable expert on plastic recycling markets. Steve Lautze is the Green Business Specialist for the City of Oakland. Lautze has worked in recycling operations and consulted on recycling market development, policy development and advocacy, and sustainable economic development. Lautze is President of the California Association of Recycling Market Development Zones (CARMDZ), and co-founder of the Recycling BIN (Build Infrastructure Now) Coalition. Steve is a longtime member and Past President of the Northern California Recycling Association and also a past President of the San Francisco Community Recyclers Board of Directors. Peter Schultze–Allen is a Senior Scientist for EOA Inc.
A consultant on Green Streets, Green Infrastructure and Trash/Litter Best Management Practices, Schultze-Allen served on Berkeley’s Zero Waste Commission for nearly 12 years. He worked as Emeryville’s Environmental Programs Manager for 11 years, during which he implemented the award-winning “Stormwater Guidelines for Green, Dense Redevelopment” that has been cited across the US as a role model for green infrastructure transformation. Schultze-Allen also oversaw programs for Bay-Friendly Landscaping, bicycle and pedestrian infrastructure, urban forestry, Zero Waste, climate change, green building, energy efficiency/generation and water conservation. This entry was posted in Blog, Featured and tagged audio recording, China, plastic-free, Plastic-Free July, Zero Waste by Ecology Center. Bookmark the permalink.